Chemistry practical work is integral to chemistry education. Laboratory sessions make chemical equations come alive, allowing students to see, and sometimes smell, taste or feel, the outcomes of these interactions. Current technology cannot replicate this learning experience. However, online courseware can facilitate the conduct of practicals. Dr Adrian Michael Lee, from the Department of Chemistry, noticed that chemistry students were generally unprepared for laboratory sessions. Students were not familiar with the techniques used as well as the skills the chemistry involved. Moreover, most depend entirely on the laboratory briefing instead of reading the practical sheet. Having seen how Bristol University used an online solution to tackle similar problems, Dr Lee approached CIT to create online courseware which would make laboratory preparation interesting, interactive and thorough. With Dr Lee’s input, CIT developed the Interactive Chemistry Laboratory Manual (ICLM), online courseware which provides students all the information and instructional resources to perform laboratory experiments. Dr Lee, the subject-matter expert, provided content. CIT designed the courseware, filmed the videos, took the photos and created various interactive elements. Since the start of AY 2008/09, ICLM has been available online for chemistry students taking certain modules. Students can visit the site before the laboratory session to run through everything that they need to know about the experiment. As laboratory time is precious, ICLM allows students to familiarize themselves with the experiments before the practical classes. ICLM covers all aspects of the experiments, from safety to preparation, from conducting to report-writing. Instructions, relevant information, data sheets and other materials cover the experiment before, during and after the laboratory session. The materials are presented in different formats: video clips of laboratory techniques, simulations, virtual instruments, interactive materials, formative and summative tests on material and pre-laboratory safety assessments have all been combined to form a guide that chemistry students can use with ease. With ICLM, students have one less excuse for not being prepared for chemistry practicals. 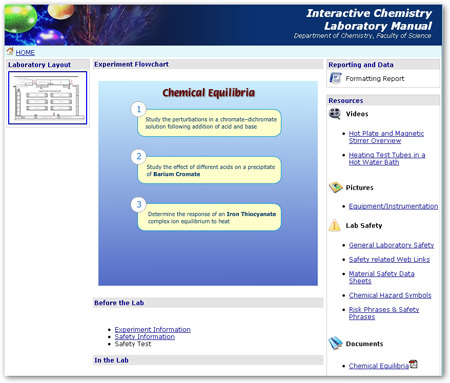 Posted in eLearning and tagged chemistry, courseware on 15 December 2008 by Kenneth PINTO. Here's some infotainment for Friday. You've probably heard of the Periodic Table of Elements, of which there are numerous online resources. Instead of a regular web-based periodic table of elements, a team of chemists at the University of Nottingham have put together a series of short videos about the elements instead. Hat tip to The Chronicle of Higher Education's Wired Campus for highlighting this. Lead by Professor Martyn Poliakoff, who has the Einstein-like crazy professor hair, the Periodic Videos team highlights interesting properties and stories about every element in the table - from Helium to Ununoctium. The Periodic Videos are also available on YouTube. Posted in Blog and tagged chemistry, youtube on 29 August 2008 by Kenneth PINTO.